Description: These two beautiful girls have been working together under the Big Top for years. And now that they've perfected their routine, they need to perfect their style. Dress them up in sequined leotards as they dazzle the crowd among the lions and tigers and bears, oh my! Instructions: Use the mouse to click on and through the floating hair, clothing, and accessory options for these two trapeze artists. 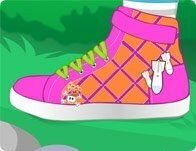 Get sporty chic with your very own custom designed pair of kicks! Bright colors, cute decals, neon laces, and whatever you want from lip to sole!